We can hardly believe it’s only 5 weeks till Christmas!! – Why not get in the festive spirit by visiting our new Christmas themed dried fruits and spices stall. Huge thanks to everyone that joined us last time for the annual Battle of the Bangers and congratulations to this year’s winner of the coveted ‘Best Bangers’ trophy…. Friends Farm! This week’s market will feature (almost) the same range of delicious products. Alongside the new Christmas spice stall we also have a new craft stall called ‘Butterlies’ with gorgeous hand-made goodies perfect for those Christmas gifts. Suffolk Goats Cheese and Suffolk Smokehouse who will back as well as the raw milk, butter, cream and local honey stall, The Perfect Crumb with lactose free brownies and other brownies and flapjacks from Made with Love. This market will feature 31 stalls which are all from within a 30-mile radius and are predominantly food and drink producers. 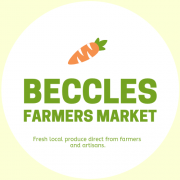 Other stalls include locally reared Beef, Pork, Chicken, Lamb, Fresh Veg, Handmade Jams, Marmalades & Chutneys, freshly caught and traditionally smoked fish and cheese, wood turners & jewellery makers, hand-made Belgium chocolate truffles, pressed apple juice, free-range woodland eggs and various baked goods.